Posted on February 6, 2019 by Betsy Jacoby-Greenleaf. I’m a big believer in being prepared for what trade show life throws at me, especially when I am onsite at one of my shows. This means bringing all of my important documents with me and keeping them easily accessible. 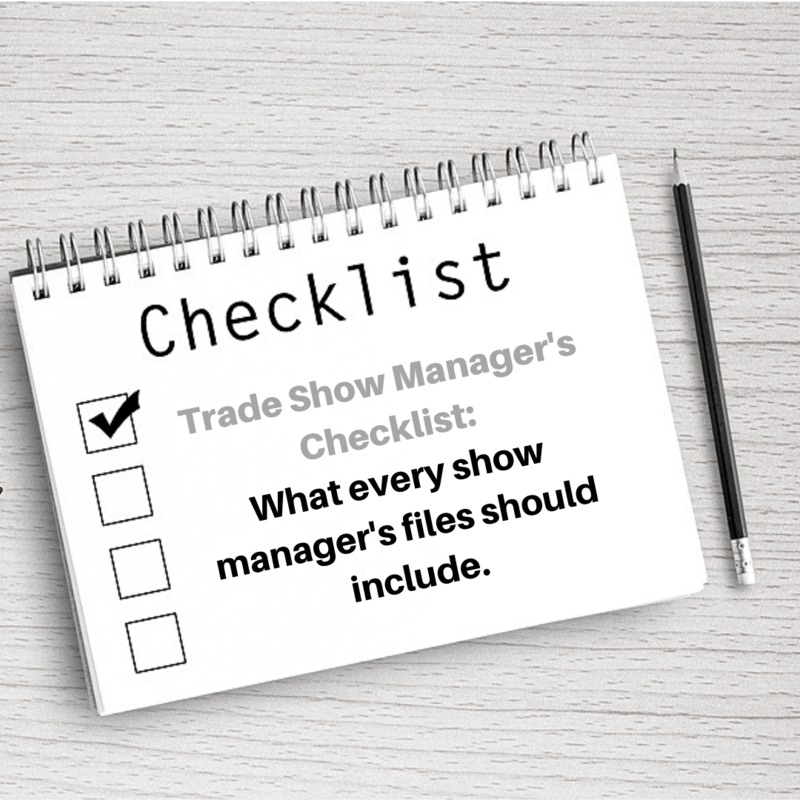 A lot of people ask me what I stuff in my show binder – I like to keep it old school, but you can stick to the modern way…just make sure you save offline – and I’m more than happy to divulge my show binder must-have files. Vendor contracts. I keep this handy in case I need to hold people accountable for their agreements if they need a reminder of our terms. Approved signage, structures, graphics, and placements. BEO’s. The Banquet Event Order is essential for letting personnel know how the room needs to be set up for food and beverage. Resume of orders. I find keeping this on hand promotes accuracy. Show Management and Sponsor Freight manifest. This document contains a complete list of cargo/freight items shipped to the show which helps me track down items should the need arise. Exhibitor manual. Without fail, there will be a handful of exhibitors that will need to peruse the handbook for rules and regulations. Business cards. A staple that every entrepreneur should have on hand for networking. List of all vendor/team leads and contact number. VIP’s. Make sure you always know who the major players are. And last but not least a must-have staple I swear by is the Tide To Go instant stain remover. Once I had a client who spilled coffee all over her white linen suit and my Tide stick saved the day. It’s a godsend. Keep one with you. Always. Whether you are like me and you bring actual files to your show or you bring them on a thumb drive, it’s a practice that I’m sure you’ll come to swear by. It doesn’t require much effort to do but can save you a lot of time and angst in the long run. Here’s a downloadable checklist of my must-haves. What are some of your trade show must-haves? Expo Planning, Show Management, Trade Show permalink.